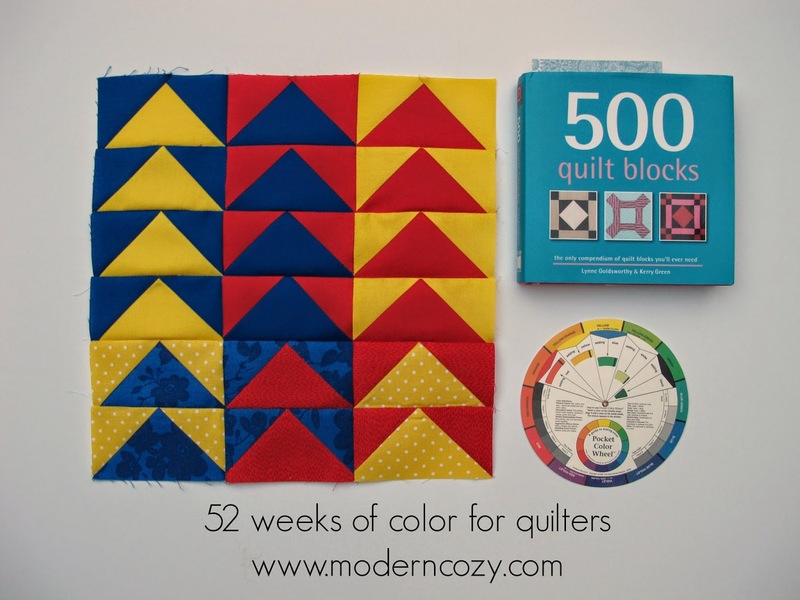 I am having so much fun making up these color blocks - I hope you guys are having fun following along! So this week we're at Tertiary Colors, also called Intermediate Colors. 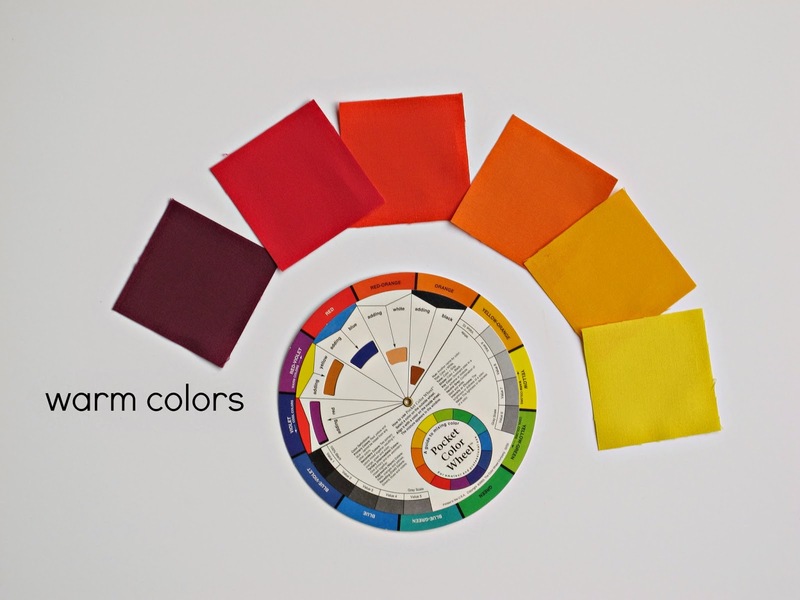 Tertiary Colors (T) are found in between Primary Colors ( P)and Secondary Colors (S) on the color wheel. 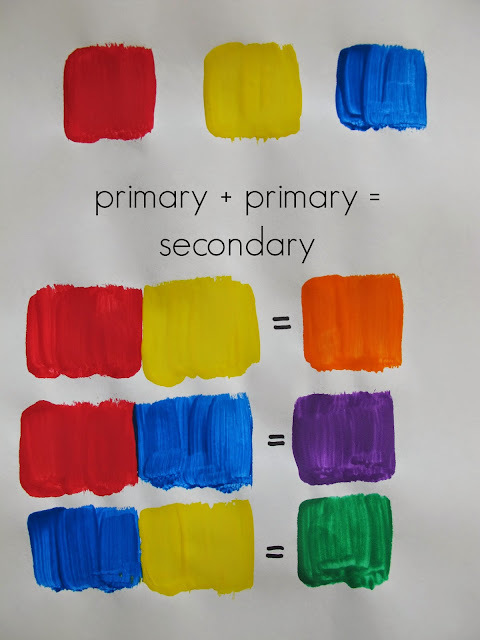 The way Tertiary Colors are created is by mixing a Primary and Secondary color. The photo above shows the progression from Red (P) to Red-Orange (T) to Orange (S) to Yellow-Orange (T) to Yellow (P). Tertiary Colors names always start with the Primary Color that is their main base and there are six of them: Red-Orange, Yellow-Orange, Yellow-Green, Blue-Green, Blue-Violet and Red-Violet. 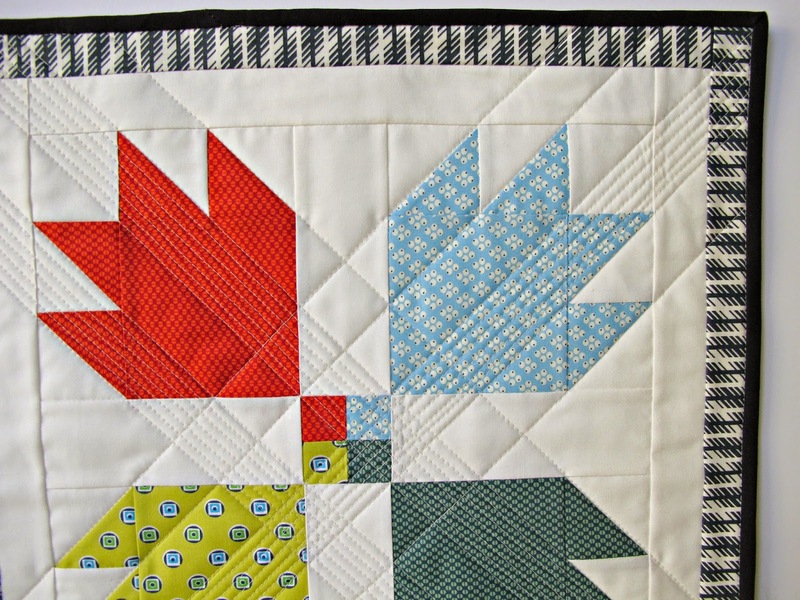 Block Details: This is the Checkerboard Block, Variation 3, pg 67 from the book 500 Quilt Blocks. 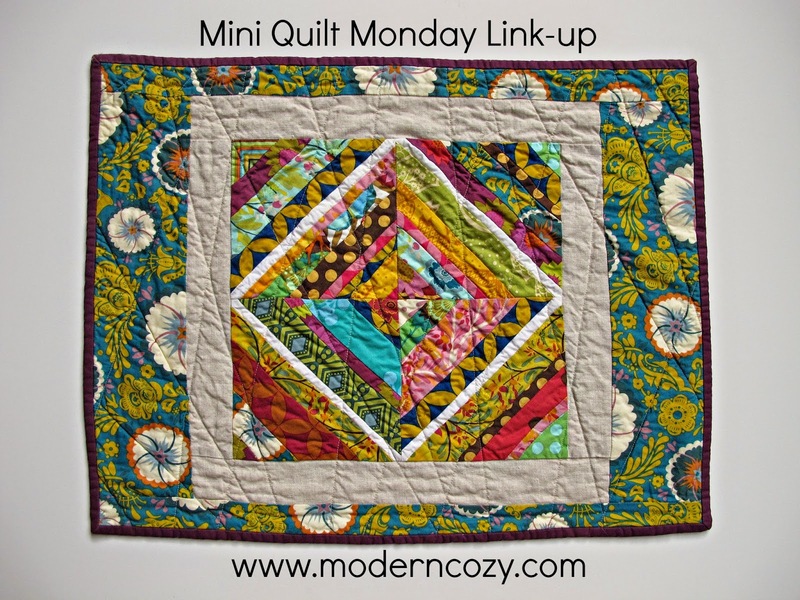 A little later than normal this week with the link-up due to...life. Ever have have one of those days just realize that it's really actually going to be one of those weeks? I'm pretty sure this is the way that May is going for EVERYONE so I'm just going to roll with it. 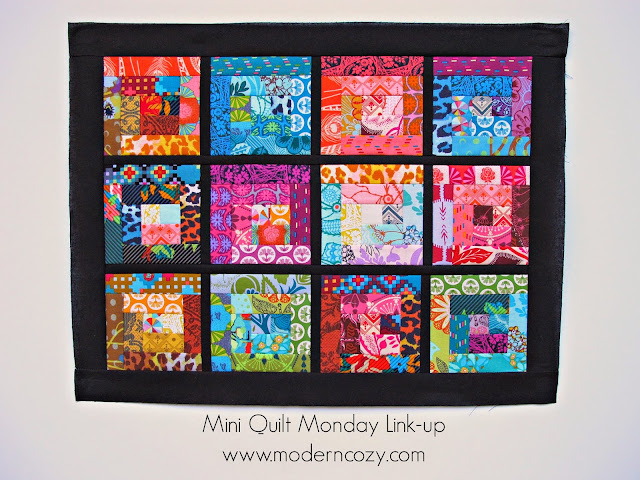 So this week I thought I'd share the very first string blocks I ever made and as I was looking at it I realized it's also the very first mini quilt I ever made as well! How fun is that? So this was at least 6 years ago and I was IN LOVE with everything Anna Maria Horner (some things never change) and I wanted to try making some string blocks. I guess NOTHING really changes around here and it's kind of making me laugh as I realize it! I used paper squares for the foundation of these blocks which I don't do anymore - way too tedious removing all those pesky papers at the end. 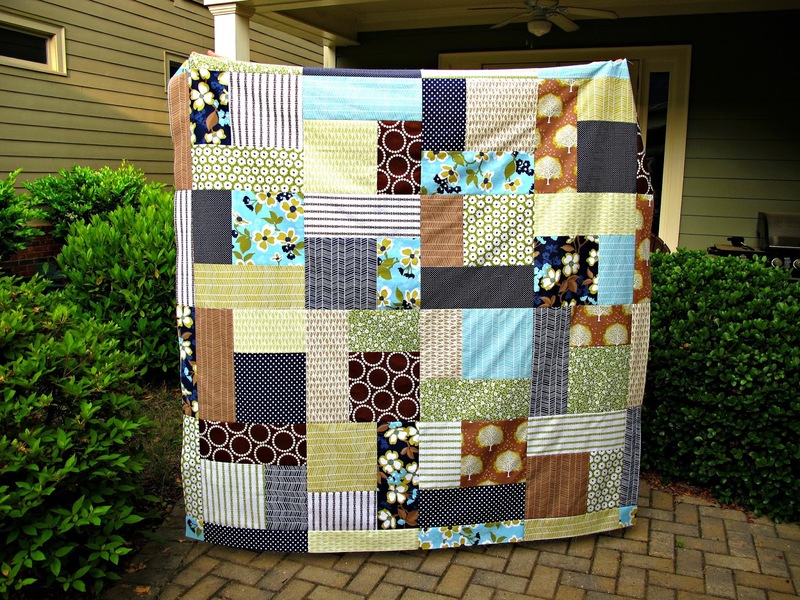 Plus I love the weight of the fabric foundation squares when the quilt is finished. I remember having no idea how to quilt this but I'd seen Ashley at Film In The Fridge do some random straight line quilting like this so I decided to try it. 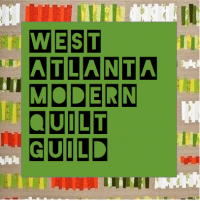 I still love this and think it's really me but I've certainly grown as a quilter since then! But it's always fun to look back and see the progress you've made right? Thanks for stopping by and hopefully sharing a small project! 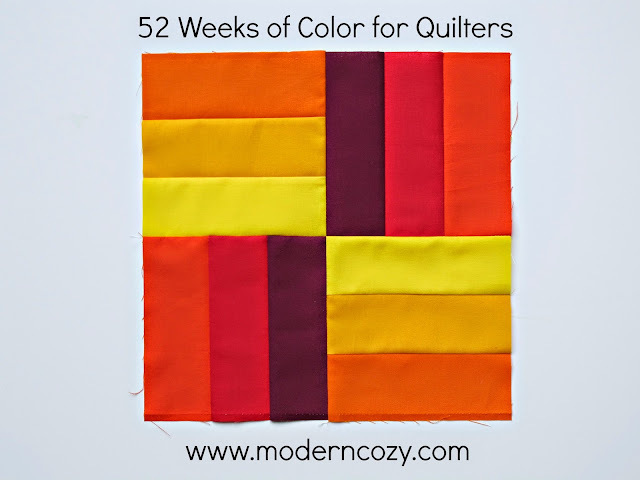 Welcome to another new series I'm starting this week - 52 Weeks of Color for Quilters! I am SO excited about this project. I'm an art teacher by trade and after spending a dozen years teaching elementary art I feel like I have some color knowledge and experience to share. Plus I just LOVE playing with color so this is going to be FUN. 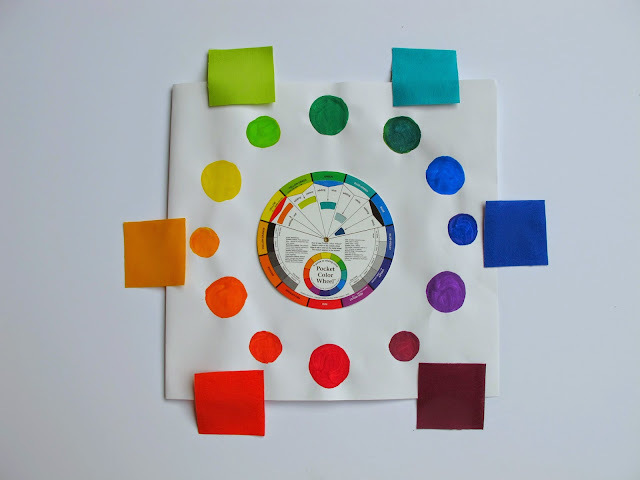 My plan is this: each week a new color concept, theory or relationship explained and explored. 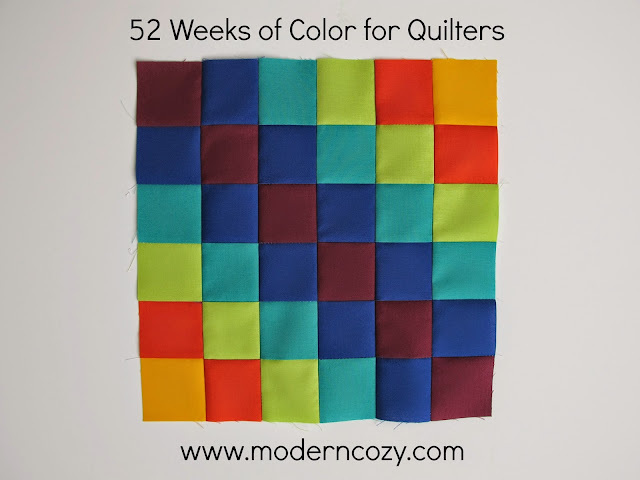 Then I'm going to create a 12.5" quilt block each week to illustrate the colors we talk about. I'm using blocks from the amazing book 500 Quilt Blocks by Lynn Goldsworthy and Kerry Green (if you don't have this book I can vouch that it's an excellent resource as evidenced by the fact I can find new blocks for a YEAR and only use 10% of what's in this book!). 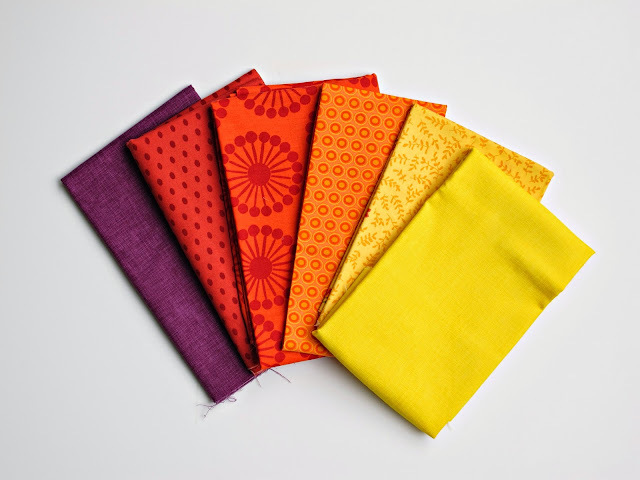 I'm going to share the exact fabrics I'm using so you can recreate the looks at home or just play around with the same palette. 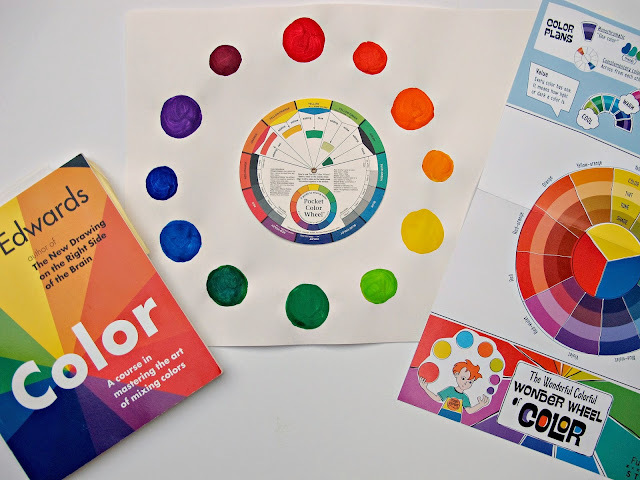 I'm going to be referring to my color wheel a lot during this series so I want to make sure everyone knows what it is - a tool that artists (originally designed for and by painters) use to understand how to mix colors and understand/develop color relationships. Colors are like girls: relationships (how they relate to and interact with each other) REALLY matter. Color is also relative, the same colors can look very different depending on the colors around them. 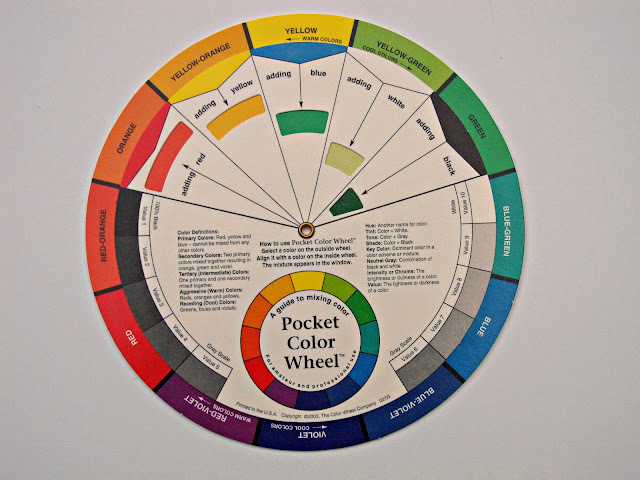 This a very traditional color wheel that you can buy at most any art/craft supply store - usually in the painting section. You might want one but it's not needed as I'll be sharing mine as I talk about it. The colors this week are PRIMARY COLORS - and they are RED, YELLOW and BLUE - the three colors you can NOT mix, you just have to have them. All the other colors on the color wheel are mixed from some combination of red/yellow/blue. So in theory these three colors are the building blocks of ALL the other colors! Why do I say "in theory"? Because there are limitations to pigments used in paint manufacturing which is why sometimes I use the green from the bottle and sometimes i mix my own - they really are very different and there are some colors you actually can't accurately mix from red/yellow/blue - this is also why printing processes use cyan/yellow/magenta. But enough color theory for one day. 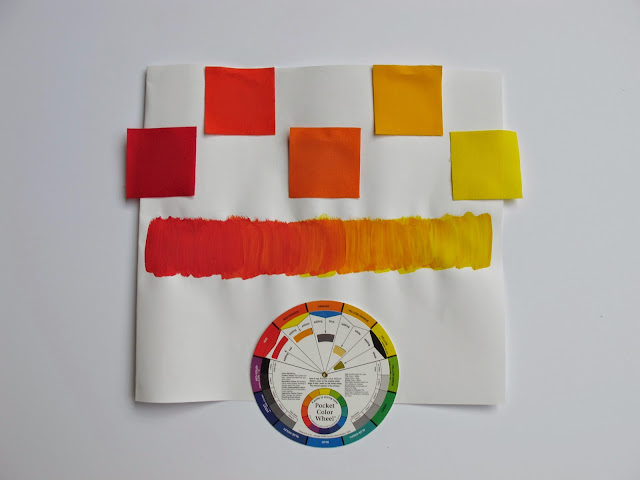 Here on the left I've painted the progression of mixing orange by combining yellow and red - where they meet in the middle is orange, closer to red is red-orange and closer to yellow is yellow-orange. 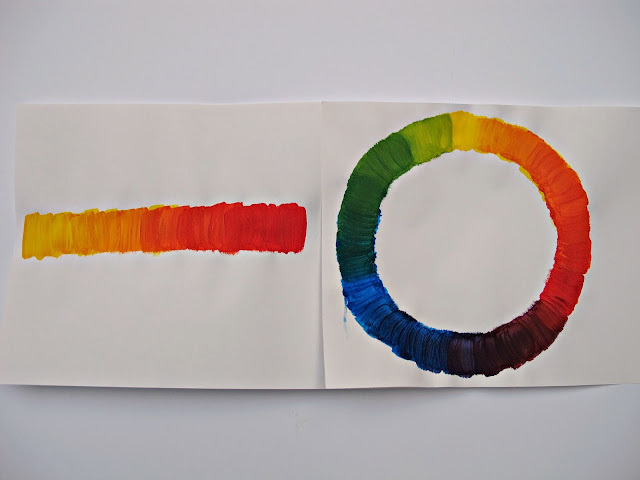 The right shows how the mixing progresses around the wheel from one primary to the next. Since we're using fabrics we won't be mixing our own colors but I think it's important to see how the colors are created because it helps understand how they relate to each other as we get further along into color relationships. So here's the block for week 1 - the Primary block! 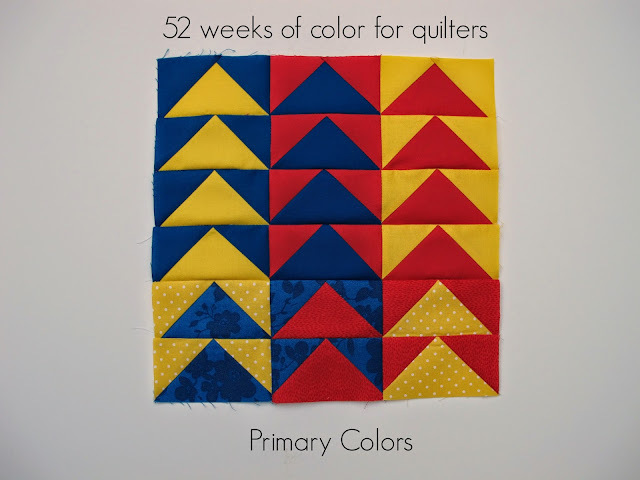 I used Kona Cardinal, Citrus and Royal Blue for my Primary colors - I love Kona's consistency of color and I'm planning on using them throughout this project. I used the Flying Geese block (pg. 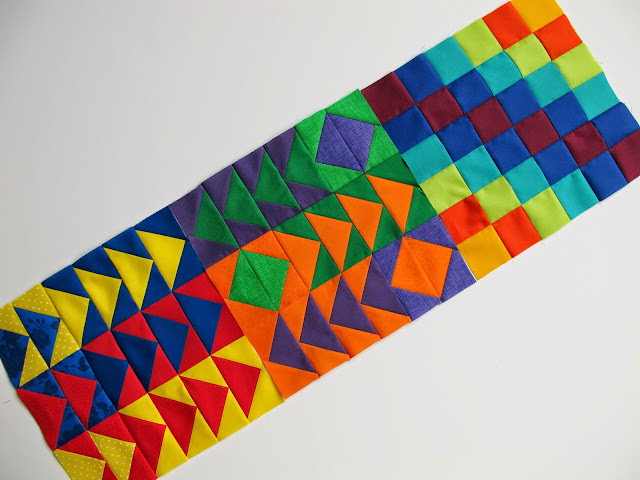 96) from 500 Quilt Blocks to make a 12.5" unfinished block. 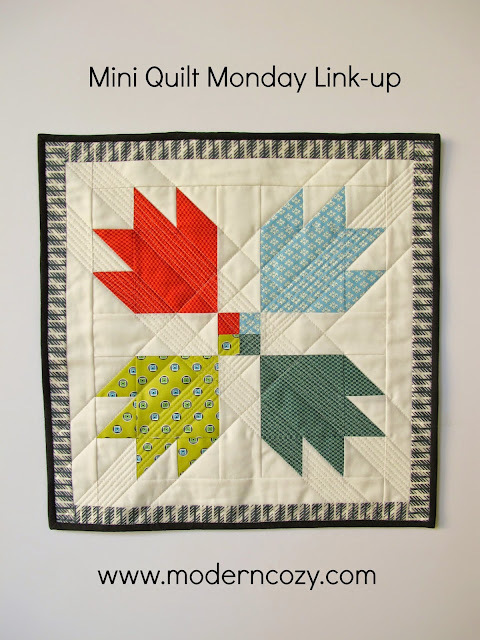 I did use a few print scraps from my stash that I matched to my Kona solids to create a couple flying geese units that are the reverse of the main Kona flying geese just to add a little interest. Up next week: secondary colors! 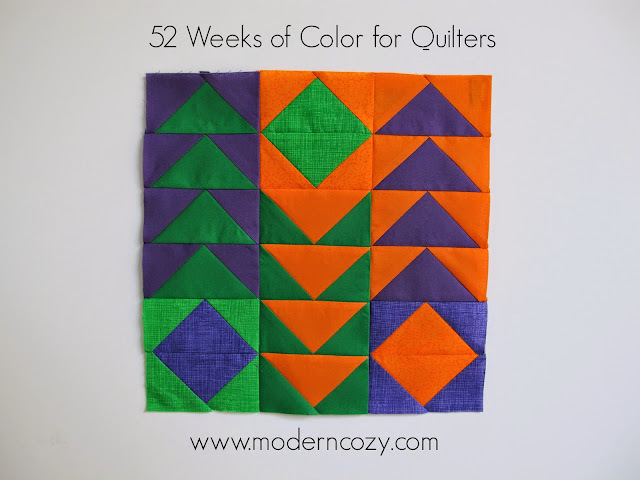 You can find my project in Instagram under the hashtag #52weeksofcolorforquilters - if you make any blocks along with me I'd love to see them. And if you have any color questions/problems you'd like me to talk about please leave them in the comments. Thanks for stopping by! Welcome to Mini Quilt Monday the LINK-UP edition! I'm so excited to be creating a place to share small creations and inspiration - thanks for stopping by and hopefully joining in! So this is my Anna Maria Horner Stained Glass mini, I've been sharing my work on IG and getting feedback. I used up some 1.5" strips that I had left over from a bigger quilt and just made small log cabin blocks. I tried to keep each block in a loose color scheme - warm, cool, light, dark. I got the awesome suggestion to use skinny black sashing from an IG friend and I am completely in love with it. 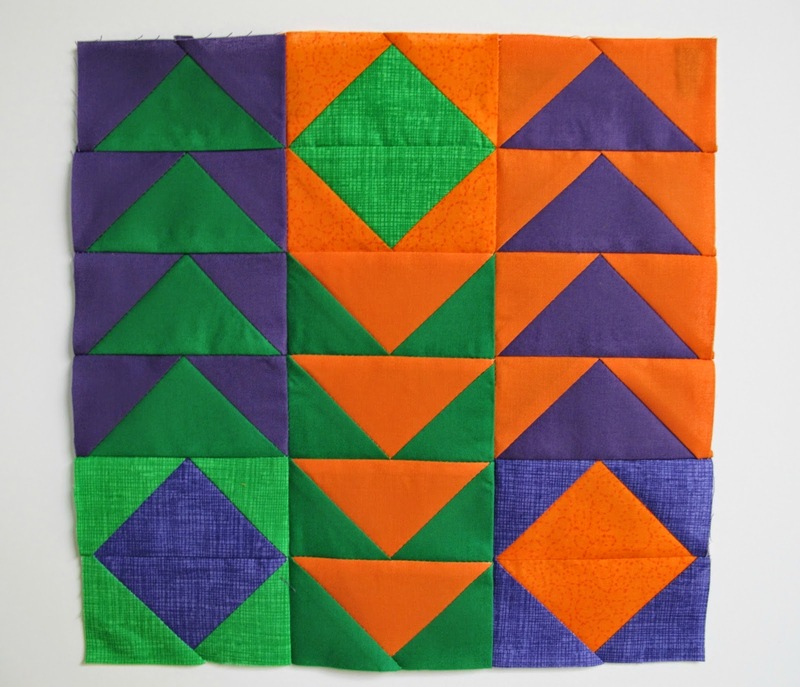 The black really creates a beautiful contrast with the bright AMH colors. Love. Sigh. Right now this top measures 19.5"x25" before quilting/biding. 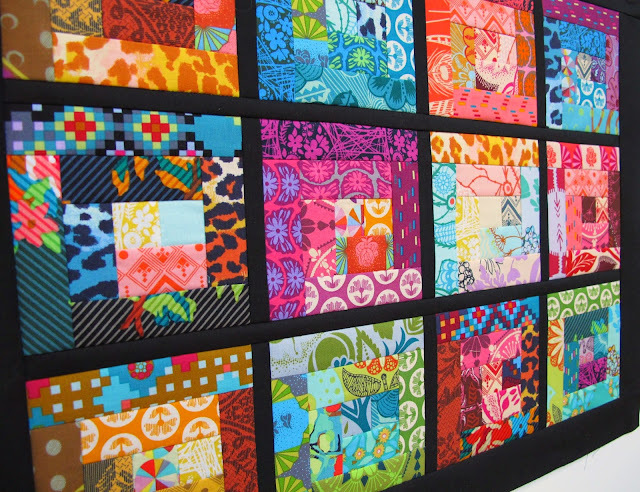 Now I'm thinking about quilting and I'm at a loss so I'm going to look at it for a few days and see if any brilliant ideas pop into my head. 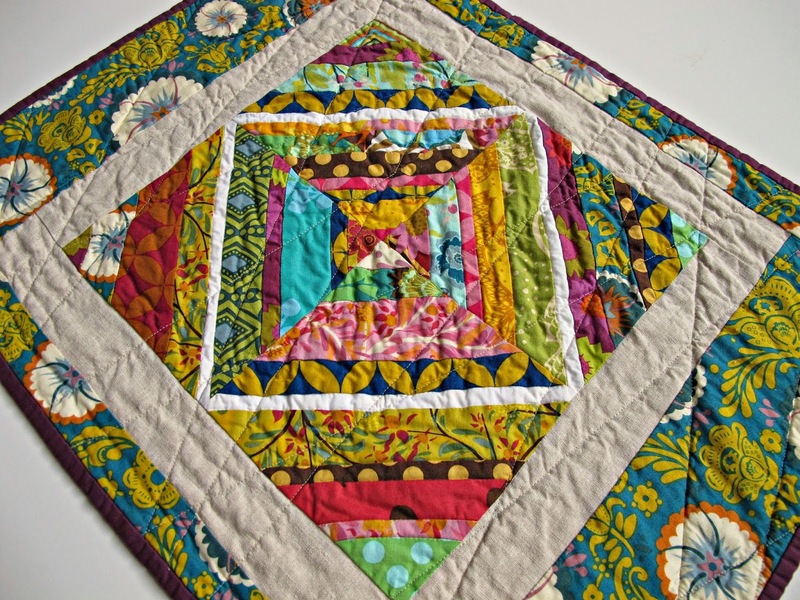 Suggestions HAPPILY taken so if you have a quilting idea please share in the comments. Please! So now for the link-up: there are so many wonderful mini quilt swaps going on (especially on IG) that I feel like I can't keep up with them all and most have their own hashtags so unless you follow someone in that specific swap or know the hashtag you might might be missing a lot of fun. I feel like I am, plus I know there is a whole world outside of IG (WHAT?! REALLY?! ;-) so I thought it would be fun to have a spot to share all our fun creations online. I couldn't find one so I'm making my own. I'm happy to have mini's in any state of completion, pillows, mug rugs - anything small. Thanks fo everyone who helped spread the word and entered my mini qiveaway last week! 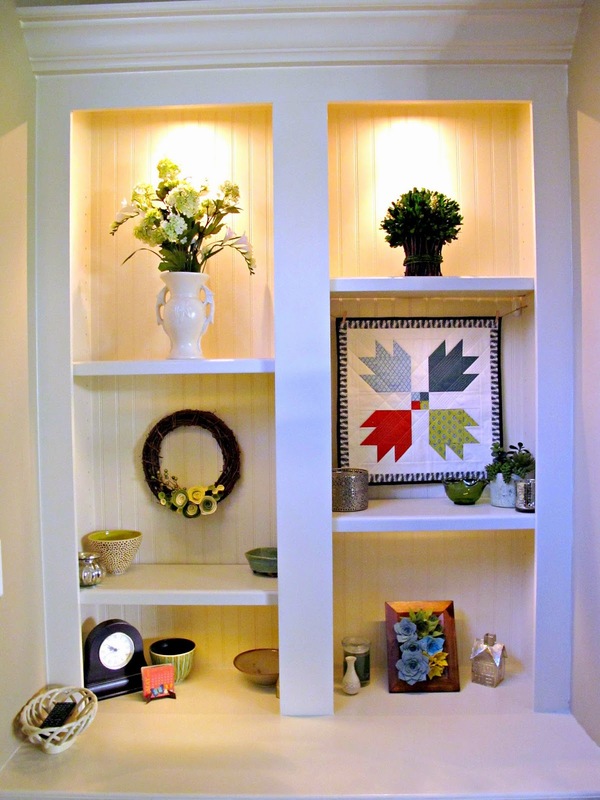 I had my in-house randome number generator choose and the winner is Elizabeth who blogs at Pieceful Life.